AFRICA/NIGERIA - The Catholic Church in Nigeria does not support or subscribe to any political party. 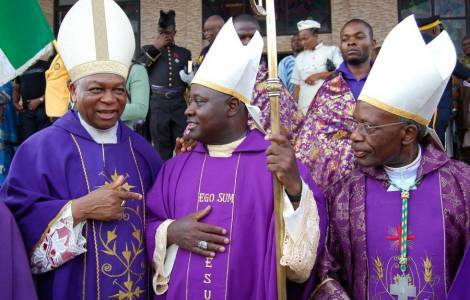 "Enough with kidnappings and murders of priests and religious in Nigeria"
Abuja (Agenzia Fides) - “No Catholic priest or people of consecrated life should be actively involved in partisan politics in obedience to the Canon Law of the Catholic Church ” says a statement issued by the Bishops Conference of Nigeria, signed by Fr. Ralph Madu, Secretary General of the Catholic Secretariat of Nigeria (CSN) with the title “2019 General Elections: Catholic Church Remains apolitica”. The statement became necessary following an argument at the Adoration Ministry Enugu Nigeria AMEN Centre, between the founder Fr. Ejike Mbaka and Peter Obi, candidate for Vice presidency for the Peoples’ Democratic Party (PDP). ASIA/INDONESIA - Upcoming elections: "Catholics in politics to build the common good"